Background and objectives The benefit of dual blockade of the renin-angiotensin system is limited by adverse effects. We performed a secondary analysis of the Veterans Affairs Nephropathy in Diabetes (VA NEPHRON-D) Study to describe the effect of increased intensity of renin-angiotensin system blockade on the incidence, risk factors, and outcomes of AKI. Design, setting, participants, & measurements In the VA NEPHRON-D Study, we randomized 1148 veterans receiving outpatient care with type 2 diabetes mellitus, eGFR of between 30 and 89.9 ml/min per 1.73 m2, and urinary albumin excretion of at least 300 μg/mg creatinine (or a urinary total protein of at least 0.5 mg/mg creatinine) to either combination therapy with losartan and lisinopril or monotherapy with losartan. We identified hospitalized AKI events and their outcomes during a median follow-up of 2.2 years through systematic reporting of serious adverse events. Results The incidence of AKI was 12.2 (95% confidence interval, 10.5 to 14.0) versus 6.7 (95% confidence interval, 5.6 to 8.2) per 100 patient-years in the combination arm versus monotherapy arms (P<0.001). Individuals with AKI were more likely to develop the primary study end point of death, ESRD, or decline in kidney function (hazard ratio, 1.78; 95% confidence interval, 1.34 to 2.26; P<0.001). Patients with AKI in the combination arm had greater recovery of kidney function (75.9% versus 66.3%; P=0.04), lower 30-day mortality (4.7% versus 15.0%; P<0.01), and lower hazard for development of the primary study end point (hazard ratio, 0.60; 95% confidence interval, 0.37 to 0.98). Conclusions Dual renin-angiotensin system blockade was associated with an increased risk of AKI compared with monotherapy, but AKI in the setting of monotherapy was associated with lower rates of recovery of kidney function, higher mortality, and higher risk of progression of kidney disease. Individuals with diabetes mellitus (DM) and proteinuria are at high risk for progressive decline in kidney function and development of ESRD (1). Blockade of the renin-angiotensin system (RAS) decreases progression of proteinuric kidney disease (2); however, monotherapy with either angiotensin–converting enzyme inhibitors (ACEis) or angiotensin receptor blockers (ARBs) does not halt progression of kidney disease (3–5). Sequential RAS blockade using both an ACEi and an ARB reduces proteinuria more than monotherapy with either class of drug, leading to the hypothesis that combination therapy would be more effective in slowing progression of kidney disease (6,7). However, increased intensity of RAS blockade is also associated with more adverse effects, including hyperkalemia and AKI (8–12). The Veterans Affairs Nephropathy in Diabetes (VA NEPHRON-D) Study was a multicenter, double–blind, randomized, controlled trial that tested the efficacy of the combination of losartan (an ARB) with lisinopril (an ACEi) compared with treatment with only losartan in slowing the progression of proteinuric kidney disease in patients with type 2 DM (10). The study was stopped early for increased rates of hyperkalemia and AKI associated with combination therapy. Herein, we describe the incidence, risk factors, and outcomes of AKI in the VA NEPHRON-D Study and evaluate the relationship between intensity of RAS blockade and the development and outcomes of AKI. The design and primary results of the VA NEPHRON-D Study have been previously presented (10,13). The study was funded by the Cooperative Studies Program of the Department of Veterans Affairs (VA) Office of Research and Development and conducted at 32 VA medical centers between July of 2008 and December of 2012. The study was approved by the human rights committee at the VA Connecticut Healthcare System West Haven Cooperative Studies Program Coordinating Center and the institutional review board at each participating site, and it was overseen by an independent data and safety monitoring committee. The study was registered at ClinicalTrials.gov: registration number NCT00555217. Veterans with type 2 DM, eGFR of between 30 and 89.9 ml/min per 1.73 m2 (calculated using the four–variable Modification of Diet in Renal Disease formula) (14), and urinary albumin excretion of at least 300 μg/mg creatinine or urinary total protein of at least 0.5 g/g creatinine were eligible for the study. We excluded patients with known nondiabetic kidney disease or hyperkalemia (serum potassium >5.5 mmol/L or need for chronic therapy with sodium polystyrene sulfonate). We discontinued any RAS blockers used at the time of enrollment and initiated losartan at a dose of 50 mg/d, increasing the dose to 100 mg/d if the potassium remained <5.5 mmol/L and the serum creatinine did not rise by >30% from the time of enrollment. After patients tolerated 100 mg losartan per day for at least 30 days, we randomly assigned them to receive the addition of either lisinopril or matched placebo in a 1:1 ratio, with stratification by site, eGFR, proteinuria, and use or nonuse of combination therapy with an ACEi and an ARB at the time of enrollment. We progressively increased the dose of lisinopril or placebo from 10 to 40 mg/d if the serum potassium remained <5.5 mmol/L and the serum creatinine level did not increase by >30% from the value at randomization. After patients reached a maintenance dose, we evaluated them every 3 months, adjusting BP medications to target a systolic BP between 110 and 130 mmHg and a diastolic BP of <80 mmHg. We measured serum creatinine and potassium at the study site at randomization, 10–14 days after each dose escalation, and every 3 months thereafter for safety; and we measured serum creatinine at a central laboratory for assessment of the primary study end point. The primary study end point was a composite of the first occurrence of a reduction in eGFR of ≥30 ml/min per 1.73 m2 if the eGFR at randomization was ≥60 ml/min per 1.73 m2 or a reduction in eGFR of ≥50% if the eGFR at randomization was <60 ml/min per 1.73 m2; development of ESRD defined as the initiation of maintenance dialysis or an eGFR<15 ml/min per 1.73 m2; or death. The secondary end point was the renal composite (reduction in eGFR or ESRD). ESRD and mortality were tertiary and safety end points, respectively. AKI was a predefined safety end point. We identified episodes of AKI through systematic reporting of serious adverse events. Detailed data were collected on all serious adverse events identified by the local site investigator as AKI events requiring hospitalization or occurring during hospitalization, including baseline serum creatinine value before the onset of AKI, peak serum creatinine during the episode of AKI, and subsequent nadir serum creatinine value; predisposing factors; need for RRT; and clinical outcomes. Local site investigators assessed the etiology of AKI (e.g., prerenal azotemia, obstructive disease, acute interstitial nephritis, and acute tubular necrosis), with subsequent independent review and adjudication by two members of the study executive committee (P.M.P. and L.F.F.). We assessed the severity of each episode of AKI on the basis of the maximum increase in serum creatinine categorized as >50%, >100%, or >200%. The decision to use RRT for acute management of AKI was at the discretion of the patients’ primary treating physicians. We defined complete recovery of kidney function as dialysis independence with a nadir serum creatinine within 30 days after the episode of AKI that was <125% of the pre–AKI baseline value. Drug allocation was not unmasked as a result of episodes of AKI. Decisions to modify study drug dosing during hospitalization were at the discretion of treating physicians; resumption or continuation of study drug was at the discretion of the study investigator, with guidance to restart losartan before lisinopril/placebo. We present summary data as numbers (%), means±SD, or medians (interquartile ranges) as appropriate. We compared the incidence, event rate, severity, and outcomes of AKI between the two treatment groups using chi-squared tests, Poisson rate tests, or Mantel–Haenszel tests as appropriate. We used Cox regression models to identify factors associated with the development of AKI and test for interactions with treatment. We also used Cox regression models to evaluate the association of the risk of a primary end point, ESRD, or death with occurrence of AKI, in which AKI is a time-dependent covariate. We calculated cumulative event rates using the Kaplan–Meier method and analyzed treatment effect using a log rank test. Because some patients sustained multiple episodes of AKI, we performed all patient-level analyses on the basis of the first episode of AKI; we included all episodes of AKI in event-level analyses. All reported P values are two sided; we considered P values of <0.05 to indicate statistical significance. We performed all statistical analyses using SAS software, version 9.3 (SAS Institute Inc., Cary, NC). We screened a total of 4346 patients, enrolled 1648, and randomized 1448 to either monotherapy with losartan and placebo (n=724) or combination therapy with losartan and lisinopril (n=724). At a median patient follow-up of 2.2 years, 210 patients (14.5%) had sustained at least one episode of AKI: 80 patients (11.0%) in the monotherapy arm and 130 patients (18.0%) in the combination therapy arm (Figure 1) (P<0.001). Baseline characteristics of the study population stratified by treatment arm and development of AKI are shown in Table 1. There were no significant differences between patients in the two treatment arms at baseline. Patients who developed AKI had higher baseline serum creatinine, had lower baseline eGFR, had higher urine albumin excretion, and were more likely to have congestive heart failure (CHF) than patients who did not develop AKI. Kaplan–Meier plots of the cumulative percentage of patients with an initial episode of AKI. The primary study end point was the first occurrence of change in the eGFR (a decline of ≥30 ml/min per 1.73 m2 body surface area if the initial eGFR was ≥60 ml/min per 1.73 m2 or a decline of ≥50% baseline eGFR if the baseline eGFR was <60 ml/min per 1.73 m2), ESRD, or death. P value was calculated using a stratified log rank test. 95% CI, 95% confidence interval. There were 105 episodes of AKI in 80 patients in the monotherapy arm and 190 episodes in 130 patients in the combination therapy arm (Table 2). 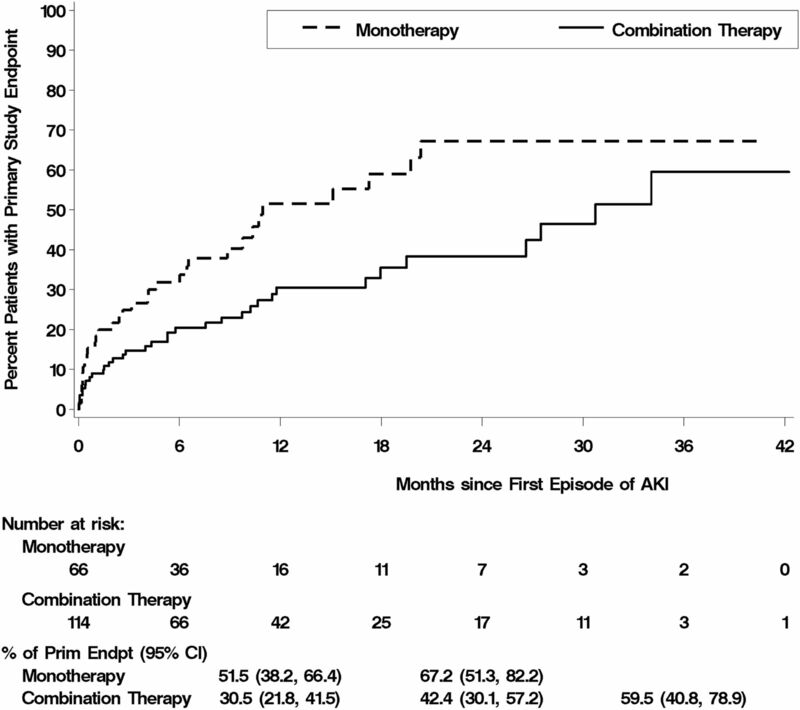 The incidence rate of AKI was 6.7 events per 100 person-years (95% confidence interval [95% CI], 5.6 to 8.2) in the monotherapy arm and 12.2 events per 100 person-years (95% CI, 10.5 to 14.0) in the combination therapy arm (P<0.001). The majority of AKI episodes were community acquired, with similar frequencies in the monotherapy and combination therapy arms (Table 2). The maximal increase in serum creatinine was ≤200% of baseline in 87.5%, with similar distributions in the severity of AKI in the two treatment arms (Table 2). RRT was used in 12 (11.5%) episodes in the monotherapy arm and 17 (9.1%) episodes in the combination therapy arm (P=0.49). The distribution of etiologies of AKI was not different in the two treatment arms; hemodynamically mediated prerenal causes contributed to approximately three quarters of AKI episodes and acute tubular necrosis accounted for approximately one quarter of episodes in both treatment arms (Table 2). In univariate analysis, higher baseline urine albumin excretion, lower baseline eGFR, higher body mass index, CHF, higher serum potassium, and assignment to combination therapy were associated with higher risk of AKI (Table 3). In the multivariate model, using stepwise selection, urine albumin excretion, eGFR, lower baseline systolic BP, CHF, and assignment to combination therapy remained associated with development of AKI (Table 3). The most recent prior outpatient serum creatinine before the first episode of AKI was 2.2±1.0 mg/dl (median =2.0 mg/dl; interquartile range, 1.6–2.6 mg/dl) in the 80 patients in the monotherapy arm who developed AKI compared with 2.0±0.6 mg/dl (median =1.9 mg/dl; interquartile range, 1.4–2.4 mg/dl) in the 130 patients in the combination therapy arm who developed AKI (P=0.06). Volume depletion, diuretic management, and other concomitant medications represented the three most common predisposing factors for the development of AKI (Table 4); the frequency of these events as contributors to the development of AKI were not different in the two treatment arms. The absolute numbers of AKI events in which urinary retention, which is unlikely to have been affected by intensity of RAS blockade, was a contributing factor were similar in the two treatment groups, but given the greater numbers of AKI events in the combination therapy arm, these were a greater percentage of AKI events in the monotherapy arm (Table 4). The distributions of doses of losartan and lisinopril/placebo were similar in both treatment arms at the time of development of AKI (Supplemental Table 1). Patients in the monotherapy arm were more likely to have their losartan dose decreased or discontinued than patients in the combination therapy arm; adjustments in the dosing of lisinopril/placebo were similar in both treatment arms (Supplemental Table 2). Although patients receiving combination therapy were more likely to develop AKI, patients in the monotherapy arm who developed AKI were more likely to die within 30 days of the episode of AKI and less likely to recover kidney function to a serum creatinine within 25% of baseline (Table 5). Using Kaplan–Meier analysis, 30-day mortality after an episode of AKI was 15.0% in patients assigned to monotherapy compared with 4.7% in patients assigned to combination therapy (Figure 2, Table 5) (P<0.01). When analyzed on the basis of the total number of patients randomized to the two treatment arms, the relative risk of death after an episode of AKI associated with combination therapy was 0.50 (95% CI, 0.19 to 1.32; P=0.16). Kaplan–Meier plots of the cumulative percentage of patients developing the primary study end point (Prim Endpt) of death, end-stage renal disease or decline in eGFR after the initial episode of AKI. P value was calculated using a stratified log rank test. 95% CI, 95% confidence interval. Patients who developed AKI were more likely to reach the primary study end point of death, ESRD, or decline in eGFR than patients who did not (hazard ratio, 1.78, 95% CI, 1.34 to 2.36; P<0.001) (Supplemental Table 3). Similar findings were seen for the development of ESRD and death; although the trend was similar for the composite renal end point of ESRD or decline in eGFR, it did not reach statistical significance. In contrast, among patients who developed AKI, patients in the combination therapy arm were less likely to reach the primary study end point than patients in the monotherapy arm, with this outcome most heavily influenced by the increased risk of death among those with AKI in the monotherapy arm (Figure 2, Table 6). After accounting for the difference in rates of AKI between treatment arms, the numbers of patients developing the primary or secondary study end points after an episode of AKI were similar in both treatment arms (Table 6). 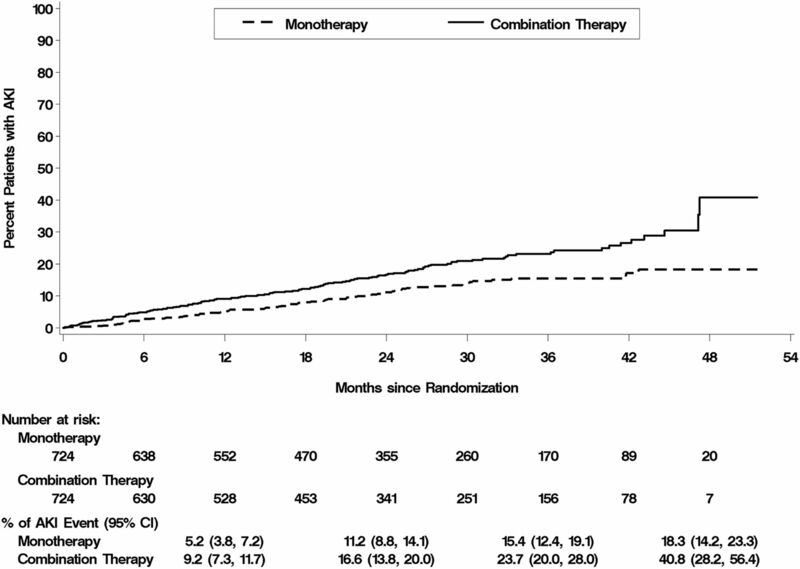 Overall, 32 individuals in the monotherapy arm and 35 patients in the combination therapy arm developed the primary study end point of death, ESRD, or decline in eGFR after an episode of AKI (risk ratio, 1.05; 95% CI, 0.83 to 1.32; P=0.70). Sequential RAS blockade using an ACEi and an ARB in patients with DM and proteinuric stages 2–3 CKD was associated with a >1.6-fold higher rate of AKI compared with monotherapy with an ARB. Although we observed no significant differences in the etiology or severity of AKI, AKI in the setting of monotherapy was associated with lower rates of recovery of kidney function, higher mortality, and higher probability of reaching the composite end point of death, ESRD, or decline in kidney function compared with AKI in the setting of combination therapy. The lower rates of these end points after an episode of AKI in patients assigned to combination therapy resulted in overall similar numbers of patients reaching the primary composite study end point after an episode of AKI, despite the greater frequency of AKI associated with combination therapy. In addition to dual RAS blockade, risk factors for the development of AKI included higher levels of urine albumin excretion and lower eGFR at baseline, CHF, and lower systolic BP. Our findings are consistent with those of other studies that have compared monotherapy with sequential RAS blockade (9,11,12). In the Aliskiren Trial in Type 2 Diabetes Using Cardiorenal Endpoint (ALTITUDE), which compared monotherapy with either an ACEi or an ARB with combination therapy with aliskiren, a direct renin inhibitor, in predominantly nonproteinuric patients with type 2 DM and CKD, there was a trend toward a higher rate of worsened kidney function with combination therapy, although rates of AKI were not specifically reported (11). In the Ongoing Telmisartan Alone and in Combination with Ramipril Global Endpoint Trial (ONTARGET), which compared monotherapy with either ramipril or telmisartan with combination therapy with both agents in patients with cardiovascular disease or DM but without heart failure, combination therapy was associated with higher rates of drug discontinuation because of hypotensive symptoms and need for dialysis or doubling of serum creatinine (9,12). In a sensitivity analysis, there were no differences between groups with regard to the individual end points of doubling of serum creatinine or need for chronic dialysis, although the rate of acute dialysis was higher in the combination therapy arm (12). Neither trial rigorously characterized episodes of AKI. The increased risk of AKI associated with intensity of RAS blockade is integrally related to the mechanism of action of these agents. In states with diminished renal perfusion and in many patients with CKD, glomerular capillary pressure and GFR are supported by angiotensin II–mediated efferent glomerular arteriolar vasoconstriction (15–17). Elevated angiotensin II levels, although helping to maintain GFR, contribute to intraglomerular hypertension, believed to be a direct mediator of glomerular fibrosis, and alter glomerular permselectivity, increasing proteinuria, which may have a direct tubulotoxic effect (18). Although RAS blockade counters these effects, altered efferent arteriolar tone predisposes to the development of AKI during periods of diminished renal perfusion or volume depletion or when vasodilatory prostaglandins are inhibited (16,19). It is, therefore, not surprising that patients with CHF or lower baseline systolic BP were at increased risk for the development of AKI with sequential RAS blockade. The balance between protective and deleterious effects of RAS blockade has resulted in continued controversy regarding the use of sequential blockade in prevention of progression of proteinuric kidney disease in patients with DM (20). Pharmacologic interventions directed at the RAS that reduce albuminuria are associated with mitigation of progression of proteinuric kidney disease and subsequent development of ESRD (21). In multiple short–term trials, dual RAS blockade with ACEi and ARB has been associated with greater reduction in albuminuria than treatment with a single agent (22–25). However, these studies did not evaluate change in kidney function over time, and the incidence of AKI was not described. In a network meta-analysis of antihypertensive therapies in adults with DM and CKD, dual RAS blockade with ACEi and ARB was associated with the lowest odds for development of ESRD compared with monotherapy with either agent alone (26). Although not statistically significant, dual blockade was associated with a >2.5-fold greater risk for development of AKI and hyperkalemia (26). In the VA NEPHRON-D Study, we did not find a reduction in the primary study end point but did find an increased rate of adverse events in patients treated with combination therapy compared with in patients treated with monotherapy (10). Although the rates of the combined end point of ESRD or decline in kidney function and ESRD alone were lower in the combination therapy arm, these differences did not reach statistical significance. Patients with higher levels of albuminuria, who might have greater benefit from dual blockade, were at increased risk for development of AKI. Sequential RAS blockade is strongly associated with an increased risk for hemodynamically mediated AKI, but AKI associated with monotherapy was associated with worse outcomes. This may reflect patients treated with monotherapy requiring a greater hemodynamic insult to provoke AKI than patients receiving dual therapy. Similar differential effects associated with RAS blockade have been observed in other settings. The use of preoperative RAS blockade in patients undergoing cardiothoracic surgery is associated with an increased risk of postoperative AKI (27,28); however, this AKI is biomarker negative, implying hemodynamically mediated AKI without structural damage (28). The clinical implications of hemodynamically mediated AKI associated with RAS blockade are uncertain. Although AKI is generally associated with increased mortality risk, worsening of kidney function associated with RAS blockade in the Studies of Left Ventricular Dysfunction (SOLVD) study was not associated with increased mortality. In patients not treated with RAS blockade, worsening kidney function was associated with an increased mortality risk (29). In the VA NEPHRON D Study, the development of AKI was associated with a higher risk of renal progression, ESRD, and death; whether this is causal or merely reflects a marker of risk cannot be determined from our data. Limitations of our data should be noted. We were only able to collect data on episodes of AKI that resulted in or occurred during hospitalization. Episodes of AKI that occurred in the outpatient setting and did not result in hospitalization were not captured; however, it is likely that these episodes were significantly less severe than those associated with hospitalization. Characterization of the etiology of AKI was on the basis of the clinical diagnosis of the treating clinicians with secondary central adjudication rather than specific protocolized diagnostic criteria. We also did not collect blood or urine samples at the time of AKI episodes for measurement of novel biomarkers. In summary, dual RAS blockade using an ACEi and an ARB was associated with an increased risk of AKI compared with ARB monotherapy in patients with DM and proteinuric CKD. Although the severity and etiology of AKI were similar in both treatment groups and AKI predicted the development of renal progression and death, patients developing AKI in the setting of ARB monotherapy had worse outcomes, including lower rates of recovery of kidney function, higher mortality, and higher probability of reaching the primary composite end point of death, ESRD, or decline in kidney function, than patients treated with combination therapy who developed AKI. Although dual RAS blockade resulted in more episodes of AKI, the overall frequency of death, ESRD, or decline in kidney function associated with AKI was not different in the two treatment arms. P.M.P. reports serving as a consultant to Baxter (Deerfield, IL). J.H.Z. has nothing to report. S.L.S. reports research support from Roche Diagnostics (Indianapolis, IN). N.E. has received payment for speaking from Merck GmbH (Darmstadt, Germany). L.F.F. reports serving as a consultant to Bayer HealthCare (Whippany, NJ). Because P.M.P. is a Deputy Editor of the Clinical Journal of the American Society of Nephrology, he was not involved in the peer review process for this manuscript. Another editor oversaw the peer review and decision-making process for this manuscript. We thank the Veterans Affairs Nephropathy in Diabetes Study investigators for their contributions to the conduct of the study and thank the patients who participated in the study. This study was supported by the Cooperative Studies Program of the Department of Veterans Affairs (VA) Office of Research and Development. The Investigator–Initiated Studies Program of Merck GmbH donated the study medications losartan and lisinopril/placebo for the study. Preliminary results were presented in abstract form at the Annual Meeting of the American Society of Nephrology held November 7–10, 2014 in Atlanta, Georgia. The opinions expressed in this article are those of the authors and do not necessarily represent those of the VA. The sponsor reviewed the manuscript before it was submitted but did not control the interpretation of the results or the decision to submit the manuscript for publication. Merck GmbH donated the study drugs but was not involved in the study design, data analysis, or manuscript preparation. This article contains supplemental material online at http://cjasn.asnjournals.org/lookup/suppl/doi:10.2215/CJN.03470316/-/DCSupplemental.